The Internet has certainly changed the way students do research. So much information can be retrieved from websites. Knowing how to properly cite them can definitely help when it comes time to construct a great essay. One popular site that offers a ton of good material for research is YouTube. There are literally millions of educational and informational videos on this video streaming website. So let’s take a look at how to cite a YouTube video MLA style. Let’s take a look at the screen cap below. 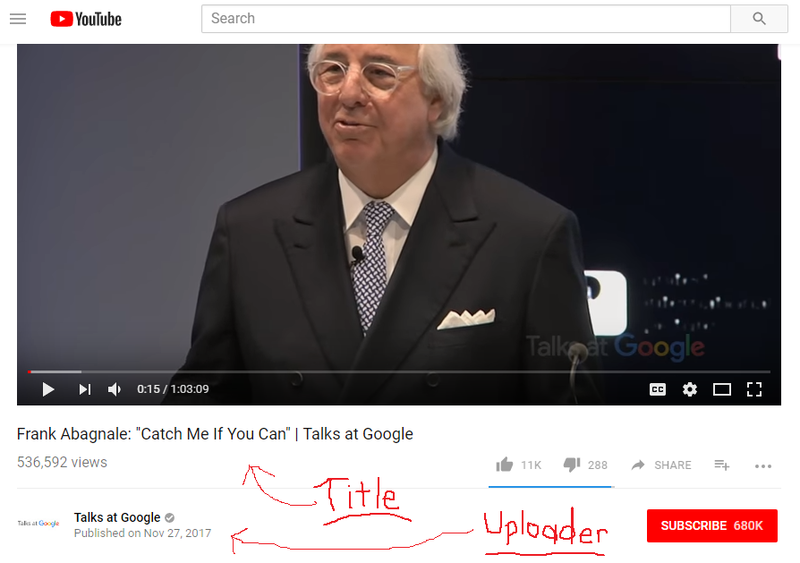 Here we have a video entitled: “Frank Abagnale: ‘Catch Me If You Can’, Talks at Google.” The uploader is: Talks at Google, and info just below tells us the video was uploaded on 27 November 2017. The URL you’ll be able to snag from your browser at the top of your screen. For now, let’s just look at a few ways you could cite this video. If your essay is about Frank Abagnale (the subject of the 2002 film Catch Me If You Can, directed by Steven Spielberg and starring Leonardo DiCaprio), you might like to actually reference a few of the man’s own words: you could turn to a book—or, since this is the age of social media and video file sharing, you might like to turn to YouTube. While some might be forgiven for assuming that it was simply easier for Frank Abagnale to do what he did because of the lack of technological security features in place forty years ago, the fact is that today it is thousands of times easier to commit fraud: “Technology breeds crime. It always has and it always will” (Abagnale). Yet what advice does Abagnale give to young consumers today? Don’t use a debit card; use your credit card: you as the consumer have zero liability if your CC info gets stolen and used. If your debit card gets swiped, it’s your money that will be lost. In this paragraph, we see that Abagnale is referenced as a direct source. His name is not used in the sentence, so it is placed in parentheses at the end of the direct quote. Where does the quote come from? It comes from the YouTube video screen-capped at the top of this page. Now that you know that, let’s take a look at how you’d cite that video at the end of your paper on your Works Cited page. When you reference a YouTube video in your paper, you’ll want to make sure to cite it correctly on your Works Cited page. There are a couple ways you could do this. “Title of the video.” YouTube, uploaded by [username here], Day Month Year, URL. “Why Big Oil Conquered the World.” YouTube, uploaded by corbettreport, 6 Oct. Briefing 1/4/2018.” YouTube, uploaded by Right Side Broadcasting Network, 4 Jan. 2018. www.youtube.com/watch?v=gyc2wvAuJbs. YouTube, 28 Dec. 2017, www.youtube.com/watch?v=vsMydMDi3rI. Or the other option is to “put yourself in a position of authority if you want to fool people” (Craig MK). YouTube, uploaded by Talks at Google, 28 Dec. 2017, www.youtube.com/watch?v=vsMydMDi3rI. The speaker in the video is Abagnale himself, so it is appropriate to use his name when referencing the video. However, it is also important to know where the video comes from—i.e., who is responsible for publishing it. The platform of course is YouTube, and that is noted in the reference. The publisher is also listed: Talks at Google. An important thing to consider when citing a video on YouTube is to get all the pertinent information and save it for later. One of the biggest mistakes novice writers can make is this: they get pumped about finding a great source, plug a quote into their paper, but fail to write down where the source comes from. Since the quote comes from a video, it’s hard to go back and scan Google for the exact lines that were lifted. You have a quote—but no way to find out where it came from because you closed out of the page days ago and you have your history set to automatically erase at the end of every browsing session. That’s why you must be very careful to be sure to take down the source information whenever you get material from a source. Like what you see in a YouTube video? Want to use it in your paper? Immediately go down to your Works Cited page and take down the necessaries: Title of Video, uploader—and, most importantly, the link to the video. Simply getting down the URL for a video source can save you a ton of time and trouble later on if you realize that you’ve forgotten to include the publication date or want to go back and examine some of the comments to the video. Our writers can help with all your citation needs. We provide model essays to customers around the world and have done so for more than 10+ years. What does a model essay get you? Good question: it gets you the example paper you need to see just how the job can get done. Say you just bought a new car but can’t get the hood to unlatch. What do you do? Hop online and watch a video of a mechanic showing you how to remove the grill, pull on the hood latch and free that baby up. Now say you have to write an essay on how you got your hood open but aren’t quite sure how it should look. What do you do? Hop online and see what the experts say. Our writers are professional academic paper writers and have literally written thousands upon thousands of essays on virtually every topic under the sun. They research every customer’s essay as per instructions, provide references, format the essay according to accepted standards, and give the client a perfect illustration by way of example just how their paper can look when they go to write it. Have a paper to write but don’t know how to get it from A to B? We know how. Let us help you. Our 100% original model essays have been helping customers for years and always get amazing reviews. Try our custom essay writing service now and see for yourself. You’ll use this information to cite the YouTube video in your paper, so be sure to jot it down when you come across it. Sometimes closing out of a tab on your computer screen without getting the necessaries can be the difference between a happy end to your research writing and hours of agonizing over how to find where such-and-such quote came from. YouTube is a great repository of information in this day and age. There are so many great talks, lectures, speeches, informative videos, documentaries, films and short films available on the video streaming platform that to ignore it is to isolate yourself from what essentially amounts to one of the greatest libraries of all time on the face of this planet. YouTube could easily be used as a reference in virtually every paper. So learn how to cite a YouTube source in your paper today—and if you need additional help, we’re always just a few mouse clicks away. "How to Cite a YouTube Video in MLA." Aceyourpaper.com. Student Network Resources Inc, 29 January. 2018. Web. 19 April 2019. Student Network Resources Inc. "How to Cite a YouTube Video in MLA." Aceyourpaper.com. https://www.aceyourpaper.com/citation-guides/mla/how-to-cite-youtube-video-mla/ (accessed April 19, 2019).